Windows 98 is no longer supported by Microsoft, so Vista is the closest option, but most people criticise it. The next option would be Windows 7. That doesn't mean it won't work on other Windows versions. This is just a recommendation. These are the system requirements of Windows 7. These days, the type of CPU is more important than it used to be. It needs at least an X86 architecture and an X64 architecture should also be fine. 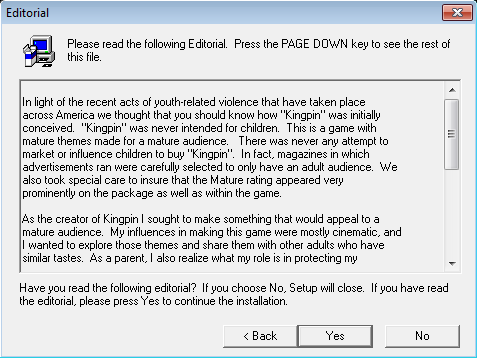 Kingpin was never compiled for a 64 bit architecture but it should not cause any problems. Something that can cause problems, however, is that some newer computers run on a different architecture, like the ARM architecture, which Windows 7 can also run on. The ARM CPU won't work with Kingpin. Luckily that type of architecture is not that common yet and you will find it mostly in tablets or small pc's. The only brands for X86 architecture are Intel, AMD and VIA. VIA should probably work, but I've never really tested it and don't recommend it. 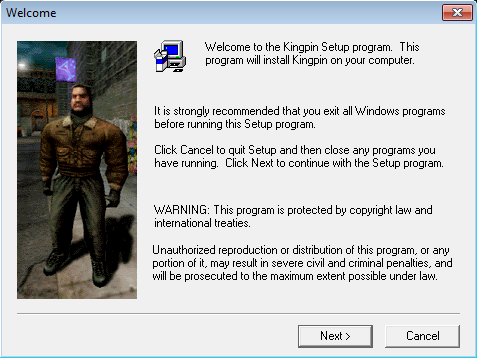 Kingpin only works in OpenGL or in 3Dfx mode, there is no directx or software mode. For OpenGL support the brands NVIDIA and AMD work best. There are also other brands like Intel, Matrox, S3, SIS, VIA and others, some of which you have probably never heard of. But mostly they won't work or I would at least not recommend using those brands. But sometimes, if you've got no choice, you can always try installing the correct video driver. 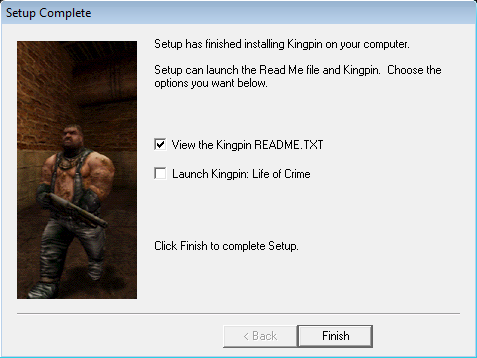 The setup of Kingpin only asks for 570 MB, with exact number for the installation of the Kingpin cd version being 561 MB (588.255.232 bytes). Not every Kingpin version has the same size and you always need free space anyway. To make the game work, video card drivers are the most important thing to have installed correctly . 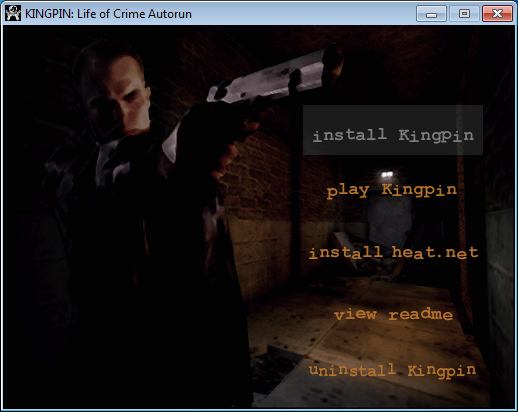 If you know exactly how to do that or have already done this, you can skip this part and go to install Kingpin. But most people install the last video card driver and then they get bugs and the game won't work. It is most important to install a stable videocard driver, which is a little difficult as most brands try to fix video card bugs for the newest games, creating new bugs for old games. So don't install beta drivers unless you are sure it' going to work. If the video card driver doesn't work, try an older/different version of the driver. Download the GLDirect utility from here and copy the opengl32.dll that comes with it to your Kingpin folder. The other fix is to download and install the nGlide 3DFX wrapper from here. The auto-run screen should appear within a few seconds. Simply click on INSTALL and follow the onscreen instructions for installation. Double click on the COMPUTER icon on your desktop. Double click on your CD-ROM drive icon. Double click on the SETUP.exe file. If you've made it this far, you will most likely have no problems whatsoever. But you can either follow the following steps, or just skip this bit and go to setup the game. prominently on the package as well as within the game. hard fought and even harder won. 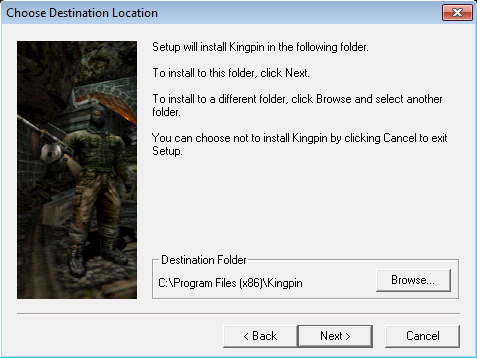 This will give you the location of where Kingpin is installed, so usually C:\Program Files\Kingpin; unless you use 64bit(X64) Windows system, in that case it will show C:\Program Files (X86)\Kingpin as in the screenshot because it's a 32bit(X86) game. 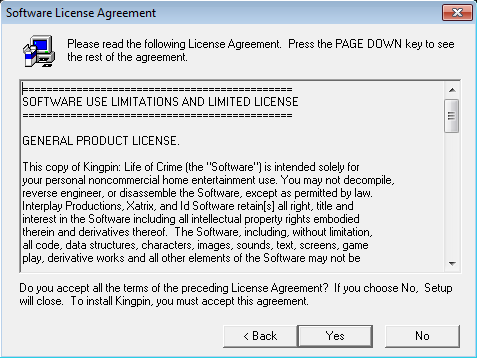 If you want to use QERadiant that comes with Kingpin you proabably don't want to install Kingpin in Program Files because can cause a lot of problems with filename mangling. Or by reinstalling the game. 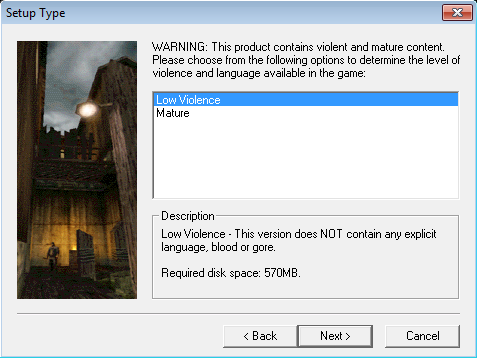 If you like cursing you probably want to install the Mature version or otherwise the Low Violence version. After choosing your version of the game, press the Next button and it's going to install the game. And a progress bar to see the progress of installing the game. The Electronic Registation is broken anyway and won't work anymore. Just press Register Later. This time choose Forfeit, otherwise it will pop up again later. After that you are pretty much forced to watcg a "Descent 3" advertisement. Just be carefull not to press that on the next screen otherwise the installer will uninstall the game and you will have to start the installation process all over again. But before you start playing the game, you should definitely first update the game in the next tutorial: Setup the game.